This is my third year in 3rd grade. I taught 3rd a while ago but most of my experience is in grades 4 and 5. I have some experience in primary and last year I realized that my 3rd grade Reading Workshop was a bit too intermediate for my early third graders. They seemed to need a more primary workshop. 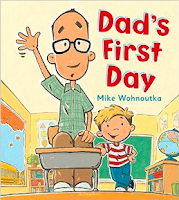 I thought long and hard about a lot of my practices and how to better support some of my younger readers who needed more time for oral language and more support in comprehension. 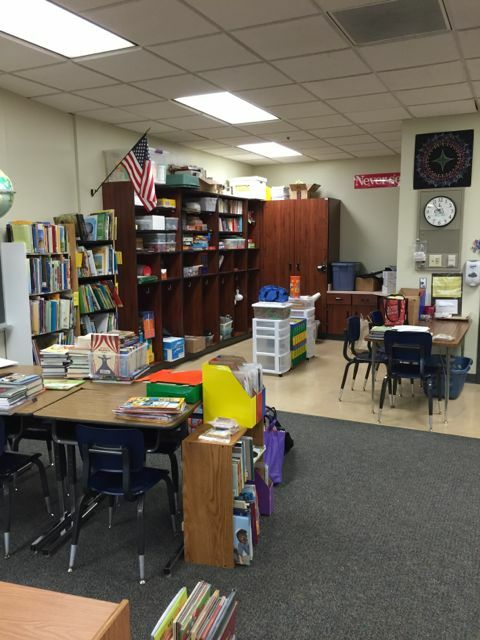 Last year, we visited Emily Collins' amazing 2nd grade classroom in our district. We were lucky to see the entire reading workshop and see the amazing work her students did. 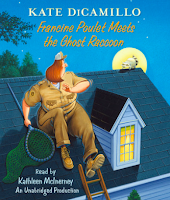 Our visit and the conversations I've had with Emily and others since that time helped me think about the best ways to support these transitional readers in grades 2 and 3--readers who aren't quite primary, but aren't quite intermediate, either. For years I've seen the power in kids keeping a Readers' Notebook but I really struggle with what that looks like in 3rd grade. Sometimes we jump in and the first part of the year is chaos as kids need more time to notice their thinking and talk through their thinking before they are ready to write much. So, this year, I am using a mini-notebook for the first several weeks of school. This is a notebook that we'll use during read aloud and reading mini lessons to keep track of our thinking in writing and sketches. 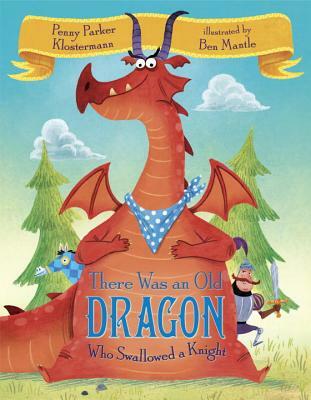 It seems to be a good size and not overwhelming for kids--the page size makes it very inviting for all readers. We are taking time to stop and jot as well as time to stop and talk. We are learning and charting different ways we think during our reading. Next week, we'll add cards or sticky notes for kids to begin to track their thinking during independent reading time also (another idea from Emily). And we'll do lot of talking during share time about the places they marked and the thinking they did. After a few weeks of playing with writing about reading in these ways, when everyone has had time to play and learn in a notebook that is fun and accessible, we'll move into reading notebooks with an understanding of what is possible. In the meantime, we'll use these pages to see what is possible. This is a little thing but it already seems like a little change that is going to make a big difference for my early 3rd graders. When we chatted via conference call about the finished poem (on the afternoon before Steve's first day back), I loved what Jan said about the process, how it's like laying one stone out at a time, building a path as we walk forward. 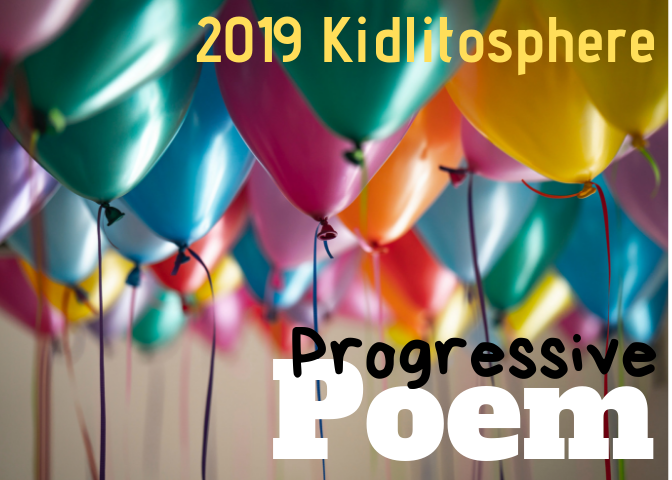 As we talked about our inspirations for each of our stanzas, or the stories behind our words, it was amazing (again) to learn from where in our lives these words had come. I was the one who divided the poem into sections this time. I was working (probably too left-brainedly) to find a flow of meaning throughout the whole poem. While I couldn't find it throughout the whole, I did find it in these sets. Steve gave us our title, and I think it's quite brilliant. This is what I'm learning from Steve and Jan as we write together -- how to string pearls. Sylvia has the Poetry Friday roundup this week at Poetry For Children. Just yesterday, I talked to my students about not judging or making assumptions, and yet, count me guilty as charged! 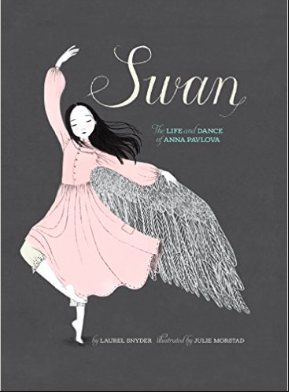 I saw this gorgeous cover over and over again during #pb10for10, but it wasn't until my reserve came in at the library and I held it in my hands did I notice who the author/illustrator was. 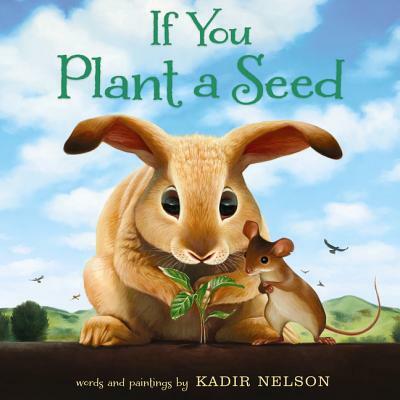 Kadir Nelson...does BUNNIES??? 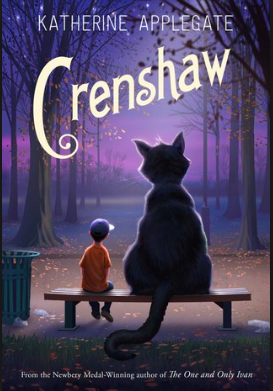 Well, come to find out and do a little research, this isn't the first time Kadir Nelson has done a book featuring animals, instead of people, but not surprisingly, the animals are every bit as expressive as his humans. LOVE the two double-page wordless spreads just before all selfishness breaks loose -- first with the rabbit and mouse (just about to enjoy their harvest) looking at the birds looking at them, and then a full-on view of the expectant and hopeful looks the birds are giving rabbit and mouse. A great place to turn-and-talk. 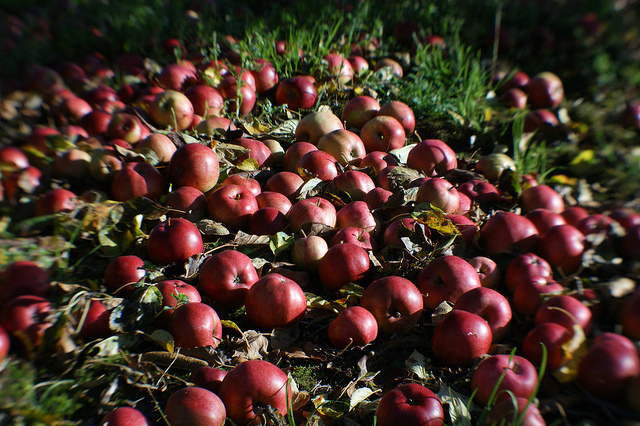 This is a story about what happens when we plant selfishness vs. what happens when we plant kindness. A good reminder for gardeners of all ages in the garden of Life. I can't wait to start celebrating failure with a new group of fifth graders. Did you have to change your plans? Did you get a new idea? Did you solve a problem? Did someone help your thinking along? I can't wait to share this book with them, and talk about a character who designs and conducts completely original experiments that mostly seem sure to fail right from the outset. 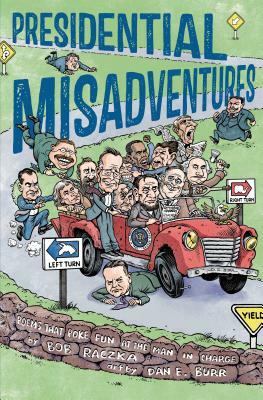 Connecting to the character in this book, I can't wait to share about the 15 year-old Iowa boy who is running for president, and who is the most successful independent candidate since Ross Perot. Last time I checked, there's no way a 15 year-old can be elected president. 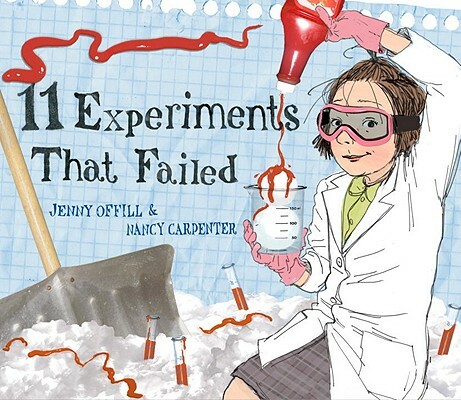 So, why bother performing experiments that are sure to fail? Get one step closer to an experiment that won't fail. 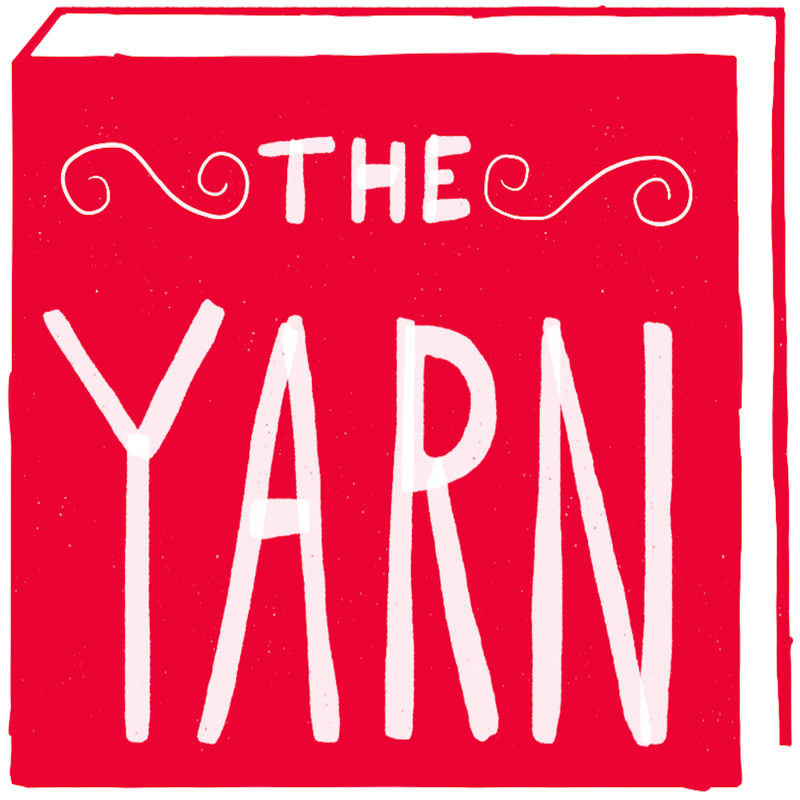 If you have not had a chance to check out Colby Sharp's and Travis Jonker's new podcast series, The Yarn, you must check it out!!! I am not a good listener so I have never paid a whole lot of attention to podcasts. I have tried a few but never got that interested in anything. I liked to SEE things while I listened. I have several friends who have recommended podcast series but I just didn't get it. They all seemed a little long and boring to me. But then last week, Colby Sharp and Travis Jonker released their first season of their new podcast series THE YARN. 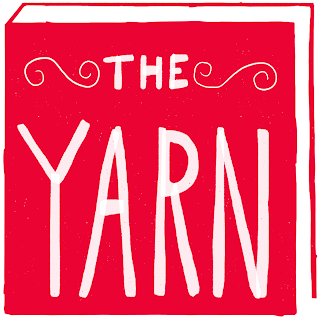 If you go to their Twitter page (@theyarnpodcast), this is described as: "A narrative of adventures. 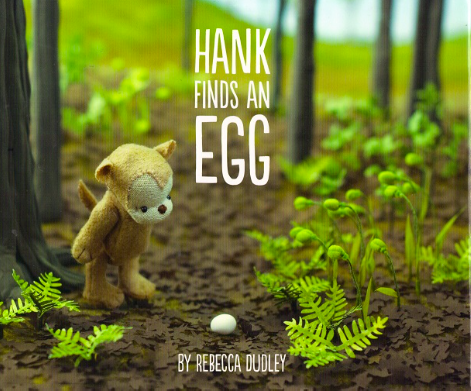 Travis and Colby go behind the scenes of children's literature in this narrative style audio show." The podcasts are produced by BkPk.Media, a site that shares narrative style podcasts centered around education. I have to admit, I only listened to the podcast because Colby is my friend. I knew it would be good, but remember, I didn't like podcasts. And I had to learn how to subscribe to and play podcasts on my phone. It was big work. But SOOO worth it. I was expecting to like it because Colby and Travis are incredible, but I wasn't expecting to LOVE LOVE LOVE it! The podcasts are GENIUS. I had no idea what was possible in a podcast until I listened to the first episode. Not only are they packed with fascinating information--the story behind the book told in such a distinct and brilliant way--but these podcasts are entertaining and powerful all at once. 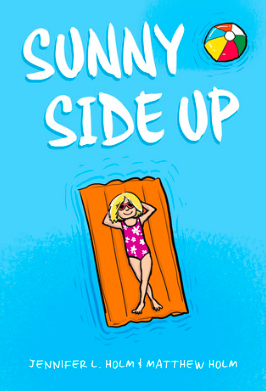 The first season of The Yarn focuses on the new graphic novel, Sunny Side Up by Jennifer Holm and Matt Holm. 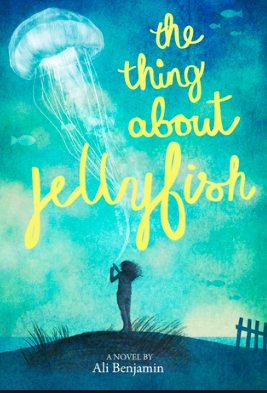 I was lucky enough to pick up a copy of this at the Scholastic Reading Summit and it is an incredible read. The podcasts add more to the story, give the reader more to think about and are just really fun to listen to. It's like you are hanging out with Travis and Colby and all the cool people they talk to. I had to listen to the first podcast twice because I was blown away by the way that it was crafted. I kept thinking it was a genre or something that was totally new to me--a type of story I have never experienced and one that I am totally hooked on now. After I listened to it twice, I made my husband listen to it. He loved it. Then we went to dinner with friends (Tony Keefer, Julie Keefer and Katie DiCesare) and we spent the first 15 minutes of dinner talking about how amazing the podcast was! Not only did I enjoy the podcasts as a listener, but as a literacy teacher, the whole digital creation piece was fascinating to me. 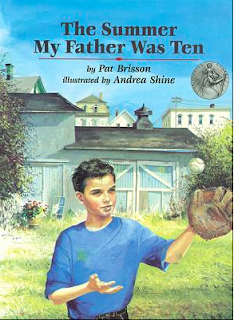 I couldn't help but think about what an amazing mentor this would be for young writers. And I can imagine the power of sharing these episodes after reading Sunny Side Up. So, you've heard enough from me! Now, if you haven't already started listening, you'll want to do that right away! You can access/subscribe to the podcasts on iTunes, Stitcher and Travis's Blog. Travis is also blogging about each episode at 100 Scope Notes. Each post adds a bit of extra info too. You can access them below. And I just found out that we, as listeners, have the chance to support more seasons of The Yarn by donating at their Kickstarter site. Check out what Colby has to say about the podcasts and the Kickstarter and think about giving a bit for them to continue this great venture! Since Donalyn started this challenge years ago, I have realized how important summer and vacation reading are to me as a teacher and a reader. That extra time to read is critical and it takes far less time every day than I imagine it will. Setting a goal of a book each day was overwhelming at first but I've discovered that it is very doable. 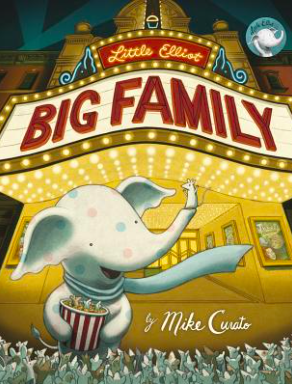 I have used the library lots and I spent many mornings reading a stack of new picture books. It doesn't take long to get through a stack of picture books and discover a few gems. 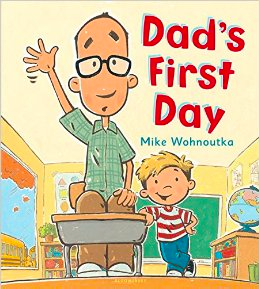 At the end of this summer #bookaday, I am reminded again of how important it is for me to read and keep up with new books, I believe strongly in the power of Teacher as Reader and always have. I need to be a reader myself in order to teach reading, but I also need to read lots of children's books so that I have a menu of books to share with students each year. 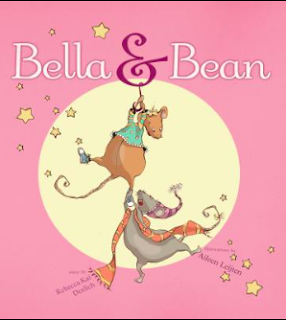 (Lucky for me, I LOVE reading children's books as I believe they are the best books out there!) As I choose books and share books with students, I know that knowing 99 more books will help me be a better teacher. It is probably the most important work I do each summer. Even with all of this summer reading, I still have a huge TBR stack. Seems like the more I read, the more I want to read! 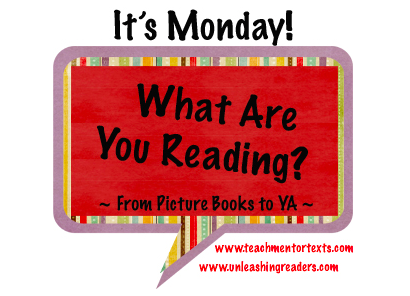 But I have so many more possibilities when I make choices about books to share with students in read aloud, mini lessons, conferences and small groups. I can't imagine going into the year without all these new titles in my head. 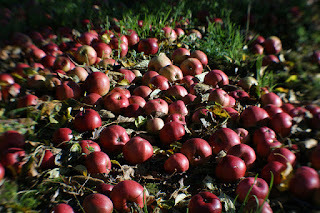 Catherine has the Poetry Friday roundup this week at Reading to the Core. I can't show you all the little teaching movies that are playing in my mind these days, but I can give you a peek at my new classroom. I'm really excited (to say the least) to be trying out some really new (for me) ways of thinking about seating and spaces. On the left, you see our office space. OUR. I try to keep my pile to a minimum, and students learn to respectfully move my stuff aside if they want to work on the big computer that sits at that desk. On the right is some common work space. 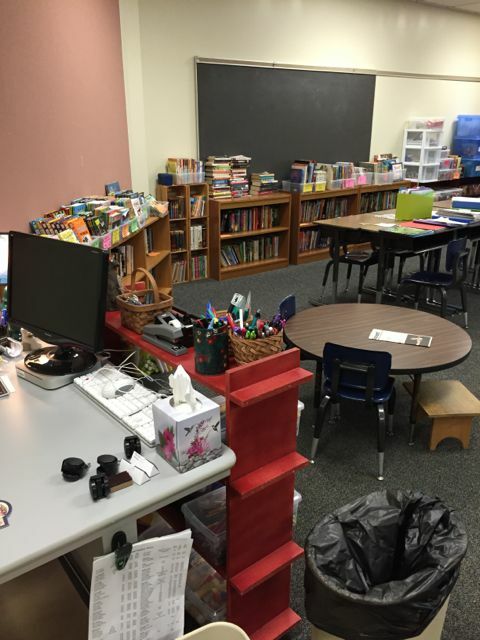 My classroom library is mostly around the perimeter of the room. Fiction to the left, nonfiction on the tall shelf by the smartboard, picture books by the window, poetry and nonfiction overflow to the right. There are three shelves anchoring tables/desks: wordless picture books, word study books, and (in the "new" shelf my neighbors generously left at their curb as "trash" -- minor damage on the bottom shelf that was fixed with wood putty) folk tales and mythology. In front of our office space, you can see a shelf for shared supplies, and a little reading/work/meeting space around a low round table. These two standing desks are new. Eight spots in my classroom without chairs. 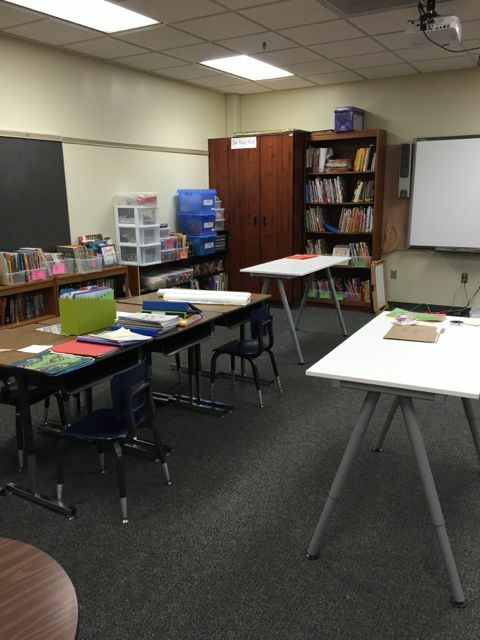 The idea for including standing spaces was inspired by several tweets from my principal, and by discussions with my brother, who works at a standing desk. I can't wait to see what my students think of this! As I've set the classroom up, I've found myself working at them all the time. Lots of professionals work standing up at least part of the time -- artists, chefs, scientists, conductors, singers, teachers...so why not students?!? This table of six has stools instead of chairs. Good for building core muscles! In the back, on the tile, we have building/making/Genius Hour materials. This pano makes my room seem as big as an auditorium! I took it standing at the smart board and looking out into the room. I started over my left shoulder at the picture books. They are actually parallel to me, not perpendicular as they seem! Same with the nonfiction on the right -- they are beside the smartboard and are looking out into the room like I am. If you focus on the center of the room, you can see the five primary work spaces, and in front of the smartboard, our meeting space for minilessons, sharing, and such. It's going to be a great year! 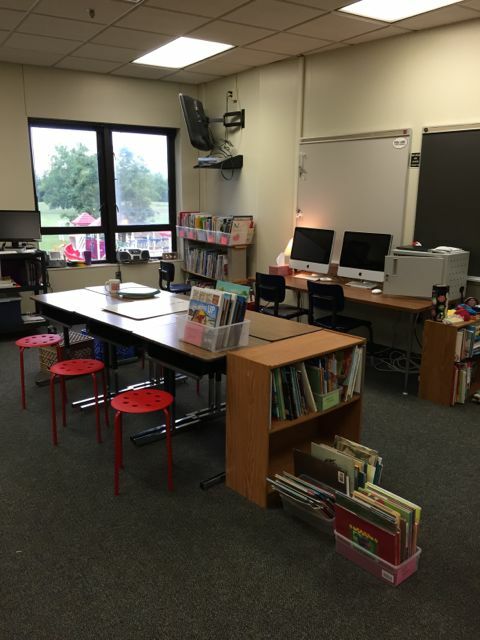 I can't wait to meet my students and get started! 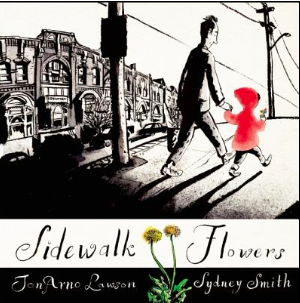 Last week, Gretchen Taylor (@GretchenETaylor) and I did a session on Series Books and Wordless Picture Books. We had a great time and gave teachers lots of time to look at wordless picture books. Here are the slide from our session. I have been reading lots of math professional books as we've implemented Math Workshop in our district. 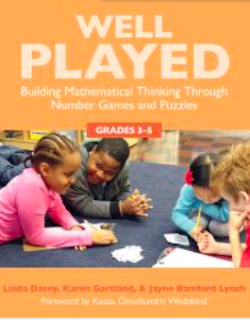 This summer, I read Well Played: Building Mathematical Thinking Through Number Games and Puzzles, Grades 3-5. This was a perfect read for me this summer as we move forward with Math Workshop. I love that Stenhouse provides such an amazing online preview on their site. 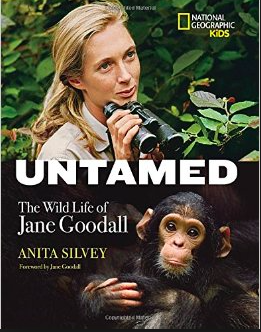 I was able to dig in and know that I wanted to own a copy of this book. I know it is one I will revisit throughout the school year. 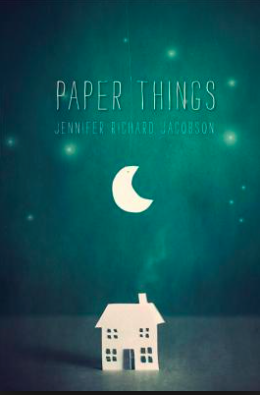 "This is a book about math games and puzzles, but it is also a book about building communities of mathematicians who work together to problem solve, talk about math and figure things out." The book begins with thoughtful chapters around the use of games in the math classroom. Early on in the book, the authors state, "...many students experience games or puzzles as fun activities or time fillers, but do not consider them as essential to their learning or as an important part of a lesson for which they are accountable." The authors go on to show us how to make games a more critical piece of our workshop and to help students have ownership of the games, their goals and the conversations they have while playing. There is a great section about discussions and the authors give lots of practical tips for teaching kids to have productive conversations while playing game. There are so many examples of these conversations, questions that push thinking and ways to differentiate throughout the book. Much of the book is organized in chapters by math concept and there are many games that support kids across levels and operations. 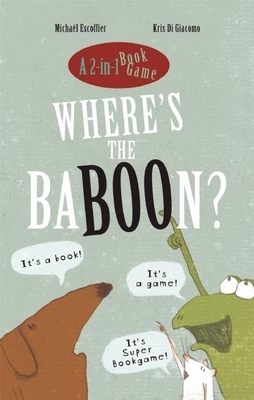 The authors give great games and give great variations of several of the games. The games focus on engagement and problem solving and give kids ways to use math vocabulary throughout. The games throughout the book are introduced in a way that you can really visualize how they might look in your classroom. Directions and materials are given as well as an example of how one teacher introduced the game in a real classroom. 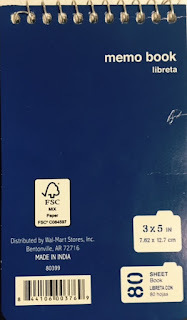 (The appendix is large and provides blackline masters for all of the games, directions, etc.) The game pages include Tips, What to Look For when observing kids play the game, Exit Card ideas and Extension of ways to change up the game. 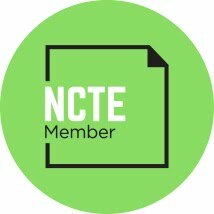 An amazing resource for intermediate math teachers! 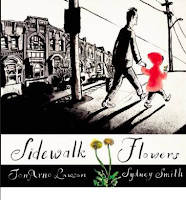 For my Picture Book 10 for 10 post, I chose my 10 favorite poetry books for 2015 (so far). You can read a little about each on Monday's post. 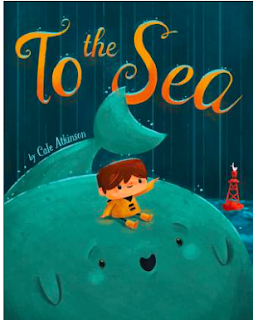 If you missed this fabulous event, for which nearly 100 teachers, librarians, professors and parents shared lists of 10 picture books (with or without a theme), you should check out the posts in the +Google Community. Hide your credit card and keep a tab open to your local library! 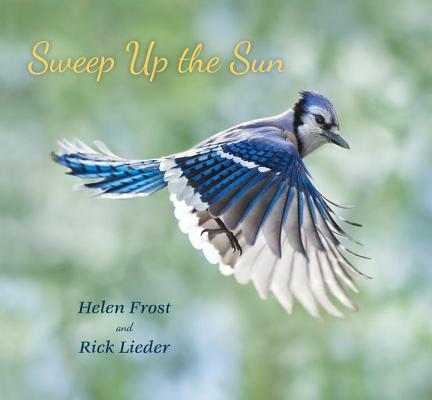 Heidi has the Poetry Friday roundup this week at My Juicy Little Universe. Fun Times in Word Study! 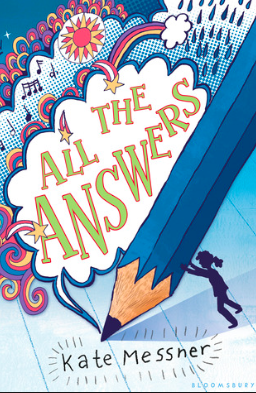 Last summer, Take Away the A by Michael Escoffier was my fun new Word Study book for the year. I wasn't the only one who got jazzed up by it. I handed it off to Carol Wilcox when I arrived at the Denver airport so she could use it in PD and then mail it back to me. This book will have readers and word-lovers looking for words-inside-words and writing stories consisting of questions. 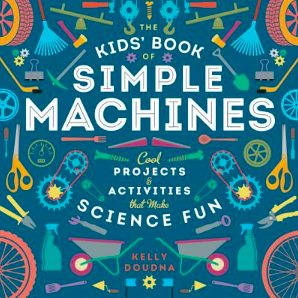 I was excited to get a review copy of The Kids' Book of Simple Machines by Kelly Doudna. We are starting a Makerspace at our school and I want to extend Genius Hour and #EdCampKids to include more Makerspace type challenges. The Educator Collaborative MakerSpace Camp was a great experience and really helped me think about revamping. (If you missed it, the keynotes by Laura Fleming and Troy Hicks are available on The Educator Collaborative Youtube Channel. Our school is implementing a schoolwide Makerspace and I am thinking how to incorporate much of the Maker thinking into the classroom. I think one challenge for me has always been keeping the exploration fresh while still making sure the students own the inquiry and thinking. So I am looking for books and resources that might invite students to try something new or to think about new things. The Kids' Book of Simple Machines is packed with information, projects and activities. I am not usually a fan of "activity" books as the activities often do the thinking instead of letting the child do the thinking but this book is a good combination of things. The book starts out sharing information about simple machines, giving basic information about the 6 simple machines. 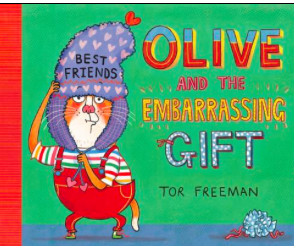 There is lots of text so I am thinking this book works for grades 3-6. 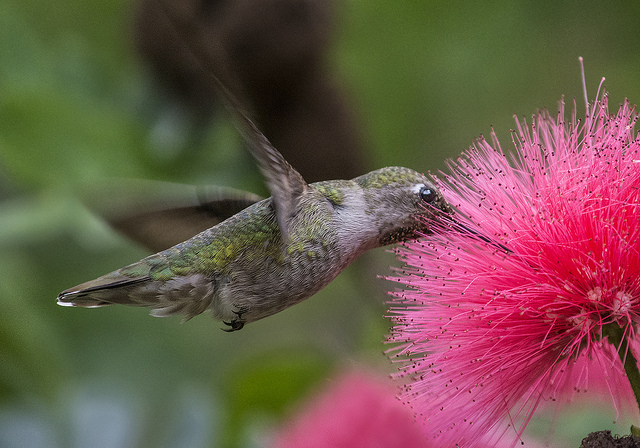 There are lots of great photos so it is inviting and accessible. One of my favorite sections is the 4 pages on "What You Need". There is a visual list of the items you need to do the activities in the book but the items can be used for so much more. It is a great list of everyday items that can be used to create and explore. The rest of the book is divided into chapters--each about one simple machine. Each chapter explains the basics of the machine, shows lots of places we see it in everyday life and then give readers projects to try. The projects give kids a way to explore the machine but the part I like best follows the project. Following each activity or project, there are sections called "Think About It!" or "That's Notable!" or "Push It Further!" These little sections give readers challenges that push thinking and lead kids into new explorations. I think they can invite good thinking and they are a good model for exploration. Overall, I am thrilled with this book. I don't see it as one that kids will read cover to cover but it is one that is packed with lots of opportunities for kids to learn by reading, doing and creating. 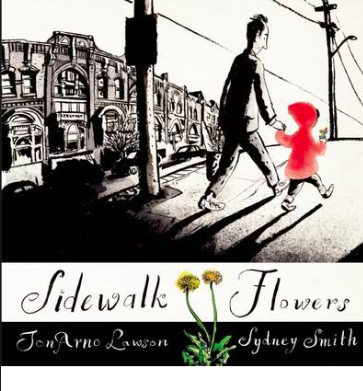 The content-specific vocabulary is woven into the text in a way that makes it very accessible to kids and the photos are used in a variety of ways so that readers can make sense of the content. Overall, a great book that I am excited to add to our classroom library! Kindness is something that we talk about all year. 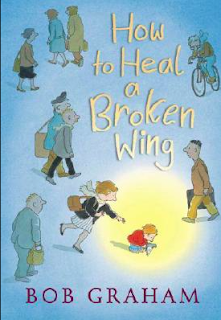 So many books invite conversations about what it means to Choose Kind. And for young children, building understanding across time is key. I have always used books such as Each Kindness by Jacqueline Woodson to invite conversations about the importance of kindness. This book is a powerful one that we read and reread several times during the year. But I want my students to see kindness play out in many ways. I want them to see kindness played out in a variety of situations. And I want them to see that it is always a choice. So I am keeping a list of books in which the characters Choose Kind (or not) in different ways. Some are more obvious than others but I think this list of books will be a great list to visit and revisit during the year. Some of the titles focus on being kind to family and friend,s while others focus on choosing to be kind to strangers. Some are big acts of kindness while others are small everyday situations. Some are new books and some are older titles. These are the first 10 books on my list and I hope to grow it as the year goes on. First, a huge shout-out to Cathy Mere (@CathyMere, Reflect and Refine: Building a Learning Community) and Mandy Robek (@MandyRobek, Enjoy and Embrace Learning) for creating this 10 for 10 event SIX years ago! Their blog names say it all, don't they? These two ladies are a force for good in the world. 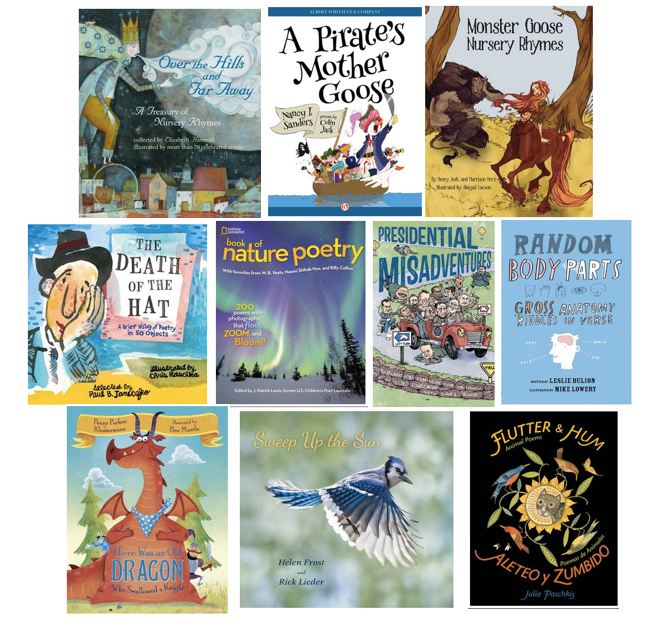 As you are getting your classroom library ready for the new school year, take a close look at your poetry shelves and see if you might need one or more of these 2015 poetry books to fill out your collection. 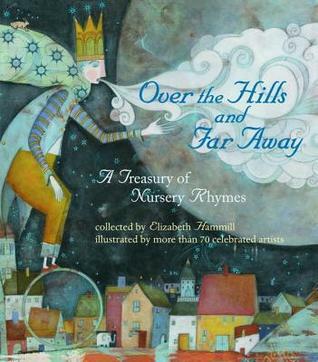 This is a collection of Mother Goose/Nursery rhymes from around the world that will stand the test of time. It is fun to study each spread and think about the way the collector chose and grouped the rhymes. The illustrations are gorgeous. 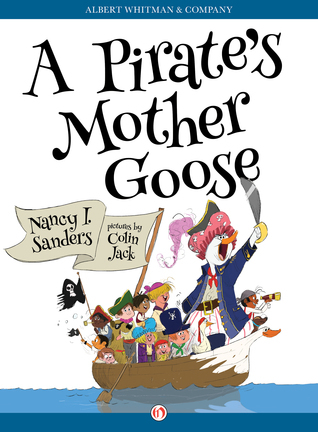 A very fun collection of parodies of traditional rhymes, pirate style! 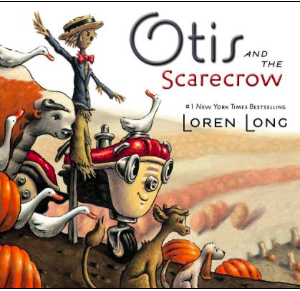 Great mentor text for writing your own version of a well-known rhyme. 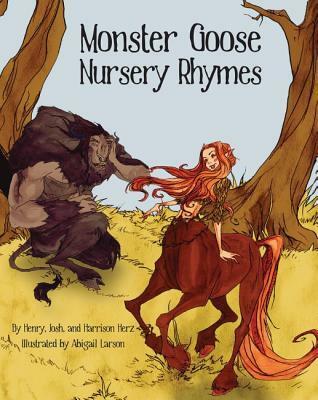 While we're doing this Mother Goose thing, let's have another collection of parodies, this time using monsters and beasts as the characters. 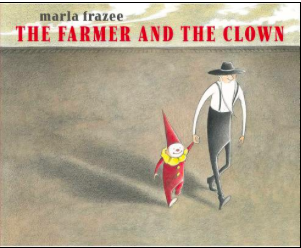 Another great mentor text. This collection is incredible. 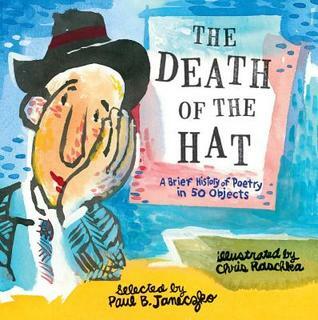 Paul Janeczko has chosen 50 poems, from the Early Middle Ages to Contemporary, each featuring an object, and each very accessible to children. Great introduction to famous poets (and some famous poems) throughout the ages. J. Patrick Lewis and National Geographic have done it again! 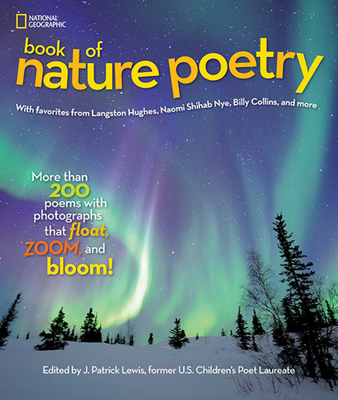 Another anthology with spectacular photography that will draw children in and invite them to see the image through new eyes by reading the poems. Come for the presidential facts, stay for the clerihews (a mentor text if you want to try to write some). 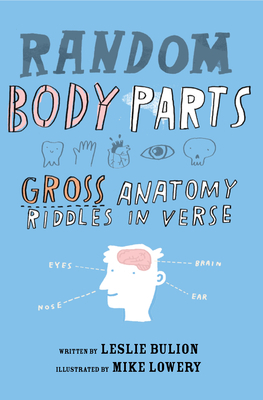 Puzzles in verse with factual sidebars and a glossary of science terms and poetry forms in the backmatter. A fresh new take on an old rhyme. I have a whole collection of "I Know an Old ____ Who Swallowed a ____" books, and this will be a fun addition! This is an exceptional example of metaphorical writing. On the surface it is a book about birds. Read it again and again and look for more. 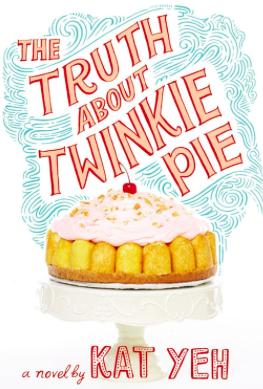 This might be your go-to book for graduation gifts this coming spring! I used it for repeated/close reading with my fifth graders. Each time they found more and more levels of meaning. 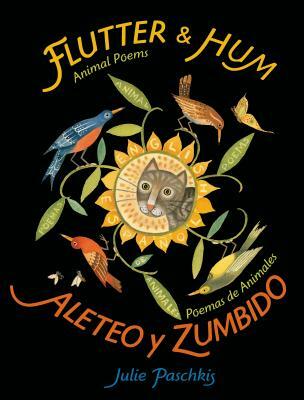 Gorgeously illustrated book of poems in both Spanish and English. 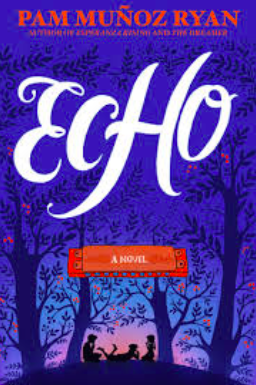 Fascinating afterword that tells about Julie Paschkis' writing process. Word lovers will pore over the illustrations and soak up new words in both English and Spanish.